Alice Russell, Stevie Wonder, The Temptations, James Brown, Gary Clark Jr. and more. This show was 37th in the global blues chart. 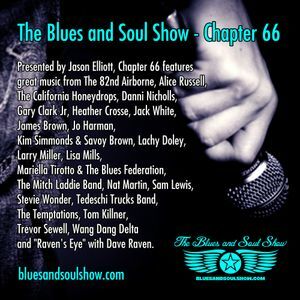 Presented by Jason Elliott, Chapter 66 features great music from The 82nd Airborne, Alice Russell, The California Honeydrops, Danni Nicholls, Gary Clark Jr, Heather Crosse, Jack White, James Brown, Jo Harman, Kim Simmonds & Savoy Brown, The Lachy Doley Group, Larry Miller, Lisa Mills, Mariella Tirotto & The Blues Federation, The Mitch Ladie Band, Nat Martin, Sam Lewis, Stevie Wonder, Tedeschi Trucks Band, The Temptations, Tom Killner, Trevor Sewell, Wang Dang Delta and "Raven&apos;s Eye" with Dave Raven.